Brunch is a popular way to entertain friends and family. Who doesn't love to sleep in on the weekends and enjoy the ultimate combination of sweet and savory foods? Hosting a brunch can be a whole lot of fun but all of the planning and prep that needs to be done is daunting. Do you have an upcoming brunch on your calendar? Trying to decide what to serve can be stressful and overwhelming. Nobody wants to make individualized omelets or wake up at 5:00 a.m. to bake four different types of muffins. Whether you are celebrating a special occasion or hosting a get-together "just because," here are some great ideas for a delicious, yet stress-free brunch. When it comes to brunch, your options are endless. You can serve breakfast dishes, lunch dishes or a combination of the two. You can go sweet, savory and even throw in desserts! A sweet option is a necessity at a brunch, and a waffle bar is sure to be a hit. The waffles can be made ahead of time or you can leave the batter and waffle maker out for guests to make themselves. Regarding the toppings, there is no wrong answer: strawberries, raspberries, blueberries, bananas, chocolate chips, peanut butter chips, nuts, sprinkles, and of course whipped cream! 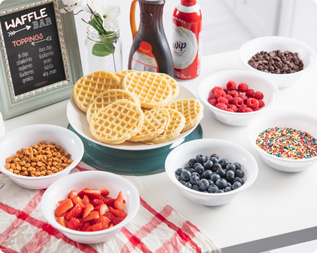 Sterilite's 20 Ounce Bowls are perfect for holding these toppings at your waffle bar. The fun part is seeing the different waffle creations that your guests make! It can be tough to entertain your guests when you are scrambling to set the table and get the main dishes in the oven. Therefore, it is key to have some grab-and-go brunch appetizers ready for when your guests arrive, especially for those who arrive early. The Sterilite Ultra•Seal™ line is perfect for this task. The 2.5 Quart Bowl is great for scones and pastries, the 4.7 Quart Bowl is ideal for fruit salad and the 8.1 Quart Bowl works perfectly for bagels and croissants. The best part about our Ultra•Seal™ Bowls is the gasket-seal lid. You can prepare all of this ahead of time and it will still be fresh on the day of your brunch. Beverages are arguably the most important part of a brunch. A drink station will create a gathering point for guests to socialize and meet one another. Here are some ideas of what to include: freshly squeezed orange juice, tea, hot cocoa, sparkling water, and plenty of coffee. When it comes to water, it is time to jazz it up! 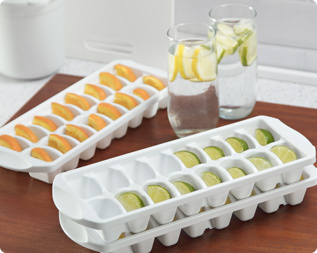 Cut up slices of limes, lemons and oranges and place them in the Stacking Ice Cube Trays to create fruity ice cubes. As the ice melts, it will infuse your drink with a refreshing fruity flavor. This is sure to be a crowd pleaser at your beverage station. A Waffle Bar is a fun, interactive brunch option that your guests are sure to love! 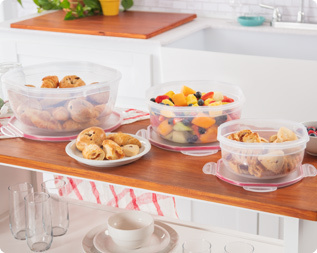 Brunch appetizers can be prepared ahead of time and served in our Ultra•Seal™ Bowls. Jazz up your beverages with fruity ice cubes to add to your sparkling water.